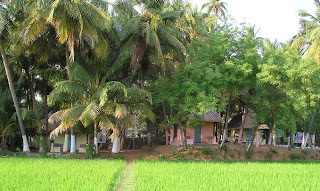 NGO News blog, NewsLine: ‘Nature: Eco-tourism to Amoor cottages’ Promotes cultural heritage of Tamilnadu. ‘Nature: Eco-tourism to Amoor cottages’ Promotes cultural heritage of Tamilnadu. TRICHY, 9th March:’ Nature and Eco-tourism to Amoor cottages’ Promotes cultural heritage of Tamilnadu ‘says Mrs.P.Chitra, Project Director of SEVAI, a NGO in Trichy of Tamilnadu, India. Mrs.P.Chitra was talking to a team of international tourists on 4th, March those visited SEVAI and she enlightened them ‘Nature and Eco tourism’ is defined as "Responsible travel to natural areas that conserves the traditions and environment and improves the well-being of local people’. Tamilnadu in India is one such state where Nature and Eco tourism is made possible with optimum learning. Tamil’ means ‘sweetness’ and ‘Culture’ has been defined as ‘sweetness and light’. ‘Tamil’ and ‘Culture’, therefore, make a most graceful combination both in Language and Life. Tamilnadu has a great tradition of heritage and culture that developed over 2,000 years ago and still continues to flourish. This great cultural heritage of the state of Tamilnadu evolved through the rule of dynasties that ruled the state during various phases of history. Tamil Culture is nothing else but the Tamil way of life, a pattern of gracious living that has been formed during the centuries of Tamil history. It has been conditioned by the land, the climate, the language, the literature, the religions, the customs, the laws, the food, the games and toys of the Tamil people, by the palmyra palm, the gingelly oil, and the vegetables associated with them’. She added’A tourist to Tamilnadu with a concept of ‘Nature and Eco-tourism’ principles can follow the following ecotourism ethics such as building environmental and cultural awareness and respect, providing positive experiences for both visitors and hosts, provide direct financial benefits for conservation. Provide financial benefits and empowerment for local people. Raise sensitivity to host countries' political, environmental, and social climate. 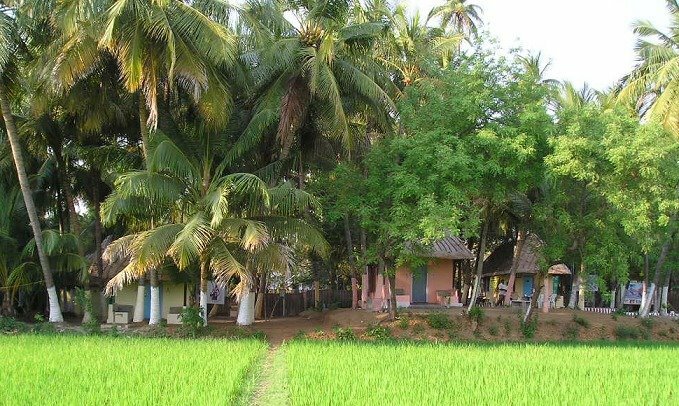 Amoor Cottages in Tamilnadu promotes "nature-based ecotourism’ that benefits local communities and destinations environmentally, culturally and economically. The main objective is to present Eco tourists the area of Trichy in an alternative manner by living side by side with locals and to give you the opportunity to visit SEVAI, the first NGO in Tamil Nadu.The stay and the package tour we propose the concept of sustainable tourism, one will get in touch with another culture in a responsible and fair way with a people-centered approach. Moreover, one can participate in the development and the prosperity of the local communities since 100% of the profits will be used to drive education and women projects within SEVAI. (www.sevai.in)’. The Administrative officer of SEVAI and Officer on Special Duty on Amoor cottages Ms.Xyian Stephen enlightened the visitors “Nature-based ecotourism’ represent a set of principles that have been successfully implemented in various global communities, and are supported by extensive industry and academic research. Ecotourism, when properly executed based on these principles, exemplifies the benefits of socially and environmentally sound tourism development. While the development and growth of nature-based ecotourism’ took various paths in different parts of the world, along with nature-based, cultural, heritage and adventure tourism had become among the fastest growing sectors of the tourism industry worldwide. More recently, ecotourism has helped to spawn a variety of new terms, such as sustainable tourism, pro-poor tourism, and responsible tourism, all of which encompass the concept that tourism can and should benefit conservation and host communities. An important trend within the development of sustainable tourism is initiatives to maintain sustainability within travel and tourism, by taking the principles and good practices of ecotourism. Ecotourism is a growing segment of the global tourism industry that is making significant positive contributions to the environmental, social, cultural and economic well-being of destinations and local communities around the world’. K.Devendaran an organic farming promoter in SEVAI spoke ‘Nature-based ecotourism’ provides effective economic incentives for conserving and enhancing bio-cultural diversity and helps protect the natural and cultural heritage of our beautiful planet. By increasing capacity building opportunities, ecotourism is also an effective vehicle for empowering local communities around the world to fight against poverty and to achieve sustainable development. Seeking authentic local experiences and opportunities to give back to the communities they visit, many eco-tourists participate in voluntary activities. nature-based ecotourism’ is a tool that provides opportunities - a financially viable tool that provides sustainable solutions to economic challenges and conservation needs of local people; an alternative means of supporting rural economies to help revitalize and sustain local heritage’. Pannir the resident Manager of Amoor cottages mentioned ‘one can stay in Amoor cottage just for one night, as a stop-over in your trip in South India, but you can especially benefit from our package tour to learn about Indian traditions and culture. Through typical activities, you will encounter national birds, local craftsmen and craftswomen and much more: Discovery of local agriculture (banana fields, rice fields…), Enjoying local delicacies on banana leaves, Sharing time with women of the village who work in Self Help Group thanks to micro credit system, Handcraft shops visits (mat weaving, pottery), Discovery of the surrounding nature,Shanti school visit, Hinduism initiation by the Brahman of the village and have visits to temples of Trichy and places of interest’.-EtNS.